This brand new, modern, and peaceful retreat is fully furnished and spacious enough to sleep 8 guests. With an open beautiful cabin floor plan, you'll never want to leave. Enjoy preparing food in the full gourmet kitchen with a farm house sink. Views of the beautiful forest can be seen from every window as this home borders Forest Service property. This is the ultimate 'home away from home'! Close to all Black Hills attractions and feet from the entrance to Custer State Park, it doesn't get any better. Fishing at Stockade Lake has never been easier as it's located across the street. Looking to take out the ATV's? Simply drive them across the highway to Hazelrodt Cutoff or trailer them to the many excellent nearby locations for ATVing in the hills! 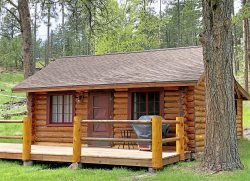 Reserve the neighboring Morris Place Cabin 1 for additional accommodations and receive $50 off per night. *Note this home does not have a standard coffee pot, instead it has a percolator, coffee filters will be provided at the cabin but not coffee. I actually never talked to anyone. I did everything online. I only wish we had more time to stay! It was by far one of the most beautiful cabins around with the best view and spacious enough for the entire family. As good an experience as I have had. THANK YOU. My previous "we'll be back", says it all.